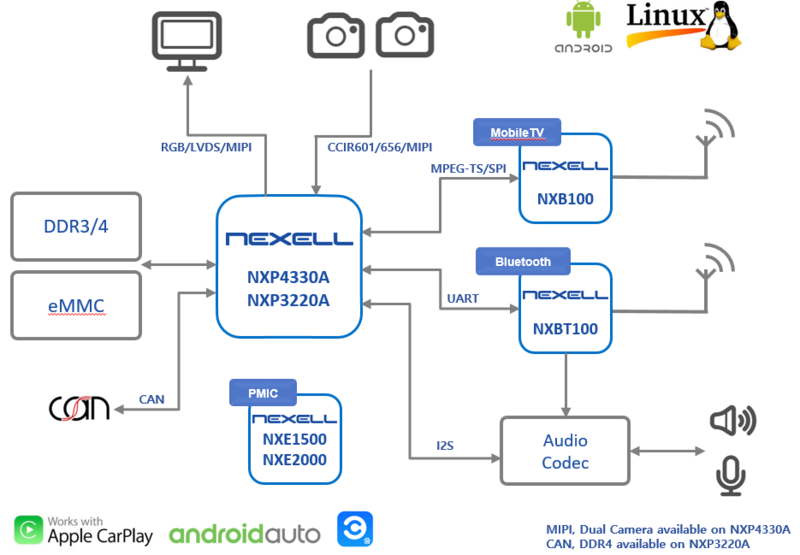 COMMUNICATION & MOBILE TVLow power BLE4.0 and the Worldwide Mobile Broadcasting SoC – Nexell Co.,LTD. Nexell's Communication & Mobile-TV lineup consists of Bluetooth module and highly integrated SoC that supports TDMB/DAB/ISDB-T and FM receiver. The Bluetooth module supports BLE4.0 + EDR, coexistence function for interworking with WiFi, and WBS / PLC function for the latest HiFi Audio. And the module has RF, RF Filter, LDO in the module. Especially the module is designed for Bluetooth Software Stack to work on Nexell AP to realize low cost. Mobile TV SoC is highly integrated SoC which satisfies the worldwide mobile broadcasting standard, and includes on chip DC/DC converter and LDO for itself, so that a simple system configuration can be achieved.